Scientists have proved that it is possible for a mother's cancer cells to be passed to her unborn child. There are very rare cases where a mother and child appear to share the same cancer, but in theory the child's immune system should block the cancer. However, an analysis by a British-led team of one such case shows the cells which caused leukaemia in the child could only have come from the mother. Whether it is possible for a mother to "infect" her unborn child with cancer has puzzled scientists for 100 years. In theory any cancer cells that manage to cross the placenta into the baby's bloodstream should be targeted for destruction by the child's immune system. But there are records of 17 cases of a mother and baby appearing to share the same cancer - usually leukaemia or melanoma. The latest study focused on a Japanese woman and her baby, who both developed leukaemia. The researchers used an advanced genetic fingerprinting technique to prove that the leukaemia cells found in the baby had originated from the mother. They showed that both patients' leukaemic cells carried an identical mutated cancer gene. However, they also showed that the child had not inherited this gene from its mother - meaning it could not have developed this type of leukaemia in isolation. Next, the researchers examined how the cancer cells could have neutralised the baby's immune system. 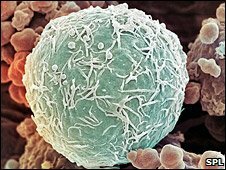 They found that the cancer cells lacked some DNA which played a crucial role in giving them their own specific molecular identity. Without this telltale molecular sign, the child's immune system was unable to recognise the cells as foreign, and thus was not mobilised to attack them. Lead researcher Professor Mel Greaves, of the Institute of Cancer Research, said: "It appears that in this and, we presume, other cases of mother-to-offspring cancer, the maternal cancer cells did cross the placenta into the developing foetus and succeeded in implanting because they were invisible to the immune system. "We are pleased to have resolved this longstanding puzzle. But we stress that such mother-to-offspring transfer of cancer is exceedingly rare and the chances of any pregnant woman with cancer passing it on to her child are remote." Professor Peter Johnson, chief clinician at the charity Cancer Research UK, stressed that it was extremely unusual for cancer to pass from a mother to her baby. He said: "This is really important research as it adds to the evidence that cancers need to evade the immune system before they can grow, giving hope that by alerting a patient's immune system to a cancer we can develop new types of treatment. "Women needing cancer treatment around the time of having a baby who are worried about this research should speak to the specialists looking after them for advice." Dr David Grant, scientific director at Leukaemia Research, which part-funded the study, said it should help work to harness the power of the immune system to first cure and then protect patients from leukaemia.